Product Junkie Diva: Are you exposed? I need to upgrade to this. I wear 15 SPF because I didn't know there were any higher SPFs that didn't feel like paste. yea, im the worst at spf. if i pick up a product and it says SPF i just think of it at a plus instead of a necessity...thanks for bringing this to my attention. I don't leave home without my sunscreen! I use Dermalogica's Super Sensitive Faceblock SPF 30! My mother begged me for years to use sunscreen/sunblock, but of course I was hard-headed and didn't... Now that I'm an esthetician I see first-hand why you need to protect your skin! @ Frugalista they even have spfs higher than 30 but I have no idea if they are heavy or not. @Mischo thanks for the product name. I am starting to think that the sensitive spfs are the lighter ones...just a guess though. I am sure you see so much in your profession so this will motivate me even more to wear that spf. Great Nywele at least you picked one up and you got level 30 good job!! !Please let me know how you like the cvs brand...is it heavy? Neutrogena Ultra Sheer Dry-Touch is nice. I'm not bad about using a sunscreen, but they tend to leave my face greasy... this one definitely did not. I actually got it as a sample from my dermatologists office! 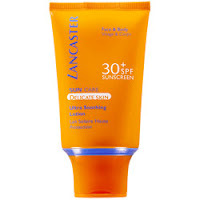 I use Lucrece SPF 30. It's actually clear zinc, so that yucky white pasty residue is a non-issue! And it doesn't clog pores which many SPFs tend to do. Most SPFs include white zinc, which is usually fine if your skin lighter than olive tone. However, I have many white and Asian friends who complain about that white look also, that's the main reason tinted SPF was invevnted. Anything higher than 30 is usually for the body, not face. @Laura thanks for mentioning that product. @Brownee thanks for this info.